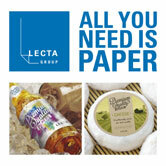 Lecta, a leading European manufacturer and distributor of specialty papers for labels and flexible packaging, will be present at this year’s edition of “Labelexpo Europe”, where it will showcase new features in its one-side coated, metallized, cast-coated and thermal papers and pressure-sensitive materials. Lecta’s extensive range of innovative, environmentally friendly products for a wide variety of end uses makes Lecta one of the foremost suppliers of paper-based solutions worldwide. At Labelexpo, Adestor -Lecta’s range of self-adhesive materials- will present SA234, a new water-soluble acrylic adhesive that leaves no residue on the labeled product and that is suitable for all types of reusable transport boxes and trays as well as for other surfaces habitually used in retail such as glass, ceramic and plastic. Another major development is the 23 µm and 30 µm PET release liners for high-speed automatic labeling in the beverage, food and cosmetics sectors. Visitors to our stand will have an opportunity to learn firsthand about the range of facestock that has been designed for premium labels for wine, champagne and spirits in addition to other Adestor products, whose range of permanent adhesives is certified for direct contact with food. The new Metalvac E LWS paper, a light wet-strength grade for glue-applied labels of non-returnable glass (eg. single-use beer and water bottles) and plastic containers (PET water and beverage bottles) is the most recent addition to the Metalvac line of metallized papers for high-end labels used in the beverage, food and cosmetics sectors. “Endless possibilities” is the title of the new Creaset one-side coated paper swatchbook for labels and flexible packaging: wet-strength grades for returnable water, refreshment and beer bottles, as well as gloss papers for standard food and beverage labels and packaging, are just a few examples of the infinite possibilities that Creaset offers. For direct thermal printing applications, Lecta’s Termax thermal papers guarantee perfect bar code definition. Our “Label” range for self-adhesive labels consists of high-sensitivity unprotected thermal papers widely used in the food, logistics and industrial sectors. Eurokote is Lecta’s line of cast-coated gloss papers. Their high whiteness, smoothness and high image definition make Eurokote papers the ideal solution for cosmetics, perfume, food and beverage (wine, champagne, spirits and water) labels. All of Lecta’s products are manufactured in accordance with ISO 9001 quality standards, ISO 14001 and EMAS environmental management standards, ISO 50001 energy management standards and OHAS 18001 occupational health and safety standards. They are available with PEFCTM and FSC® Chain-of-Custody certifications, thereby guaranteeing that the wood used has been sustainably sourced.